Something a little different today as we time travel back to the Medieval era in the company of Chris Nickson, author of The Holywell Dead, which is available now. In this guest piece, Chris reflects on saying goodbye to series characters. Even before I sat down to begin writing The Holywell Dead, I knew it would be the last book to feature John the Carpenter. Some series can run and run, going on well for many volumes, and sometimes growing better with each one. 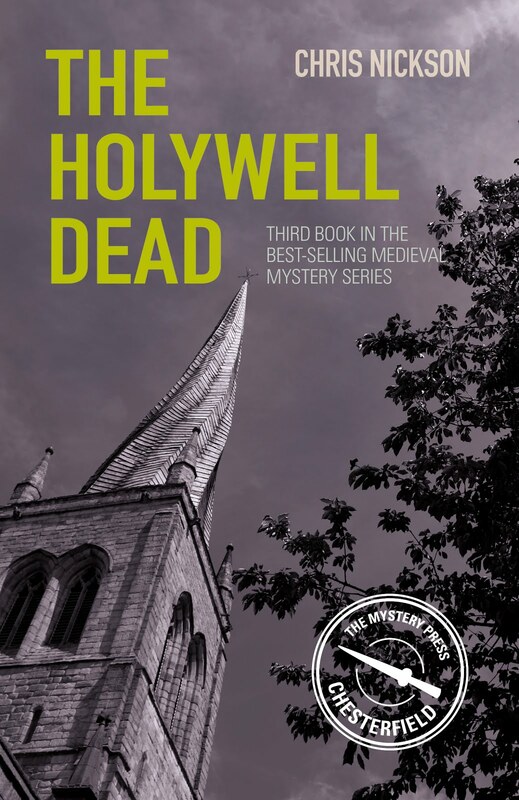 Others, though, have a limited span, and in my heart I knew these medieval Chesterfield mysteries fell into the second category. I’ll miss John Katherine, Walter, Martha, the entire extended family. I love them, they’re real, fallible human beings, so it’s a bittersweet farewell. They came to me in a group one day with the first story in the series, The Crooked Spire. That one was a gift. Driving through Chesterfield, the entire book came to me in the span of about 10 seconds; all I had to do was write it. It was one of those rare gifts that writers don’t refuse. I knew the town well and liked it; for more than four years I lived just six miles away in Dronfield, and went there to shop, to spend time and explore. It’s kept its history well, and the church with its crooked spire is a thing of wonder. But John is a carpenter. It’s more than his trade, it’s his passion, and he has a feel for wood that he doesn’t want to set aside. Having him solve the mysteries behind a few deaths comes within the realms of possibility. Too many, though, and I’d be straining belief. This, I think, is as far as I can go. More than that, Chesterfield was a small town in the 1360s. When a big city like Norwich or Bristol might boast 4,000 and 6,000 people respectively (York had 7,000 and even London only 23,000), somewhere like Chesterfield, even though it was a market town serving a wide area, would be lucky to have more than a few hundred people living there. Realistically, the scope for stories was at an end. Obviously, no spoilers here, but the book unfolded in a way that made for a good end to the series – at least I feel it did. John survived the Great Pestilence of 1348, he’s had his time of wandering and sorrow. Now he’s settled, and he’s done his duty as the Coroner’s often unwilling helper and conscience. It’s time to wish him – to wish them all – a long and happy life.